It’s 2010 and my internet connection’s jackassery has been thwarted, so it’s time to make an announcement that I intended to make a while ago. Before the internet connection’s jackassery. As you’ve noticed already, I haven’t posted a Rent-A-Thug comic in about a month now (I don’t count the Christmas special). After drawing 305 pages/strips, which makes it the longest-running project I’ve ever worked on, I feel like I need a change. Effective immediately, Rent-A-Thug is going on an indefinite hiatus. I feel like I’ll probably go back to it at some point, but for now I need to go in another direction. Starting at some point in the next couple of weeks I’m going to be debuting a new comic, which will be conveniently located right here on this site. “HEAT: The Space Age of Pro Wrestling” will be starting up soon. I’ve been watching wrestling with varying levels of interest since I was seven years old, and have been kicking around the idea for a wrestling comic for a few years now. I’ve been thinking about starting a new webcomic for a while now, but could never decide what I wanted to do. I came up with a few projects, but none of them really grabbed me and held my attention for more than a few pages. HEAT hooked me hard. I don’t think it hurt that, as far as Google is concerned, there are only about three wrestling webcomics out there (as opposed to tens of billions of “two gamers on a couch” and epic fantasy comics). As of this post, I’ve written the first 48 pages and am nearly finished drawing the first chapter, which works out to be somewhere around six weeks worth of comics, based on the schedule I’ve got in my head. I’ll be updating you guys on the progress of HEAT’s start-up as things get done. Site-wise it’s not gonna be too much different than this one. I might try some stuff like putting some ad space in and prettying things up a little bit, but in terms of function it’s going to be pretty much the same. I’ve installed WordPress and ComicPress enough times that the basics should be up and running by the end of the week, but the fancy stuff will probably take longer (y’know, cool graphics for those stripey things down the side, a logo for the header, the ad space, that kinda thing). The comic itself will hopefully be up and running in about two weeks’ time. I sincerely hope that you guys have enjoyed Rent-A-Thug as much as I enjoyed working on it. I also hope that you’ll jump on board with HEAT and make it an even more rewarding experience than Rent-A-Thug has been. I haven’t done as many of these as I’d have liked to by now. I was going to last night, but then I got distracted by learning how to work the book layout program I got. I need to print some test pages to make sure I’ve got the margins right, but so far I seem to be getting the hang of it. This here’s a panel from page 2. It was used as part of a piece I wrote for the U of A Gateway about 24 Hour Comic Day. It was originally intended as a big reveal, but I quickly realized that it wasn’t much of a reveal, since I never really tried to hide the fact that the characters were demons. Actually, it’s the first thing I mention any time I describe the series to somebody. So it’s not so much of a reveal as a really intricate panel where a demon tries to brush his teeth and put on pants simultaneously. It involved me standing in front of a mirror holding one hand up like I was brushing my teeth and then pulling my pants on with the other hand to figure out what it would look like. I’m sure if anybody else was awake I would have looked like a complete jackass. Hell, Inc. is the newest project that I’ve spawned from my thinky-meats, and last night I finished page 24, the final story page. I still need to finish the covers, and do the dreaded digital pre-press, but it seems like it should be all finished in time for Indie Week. 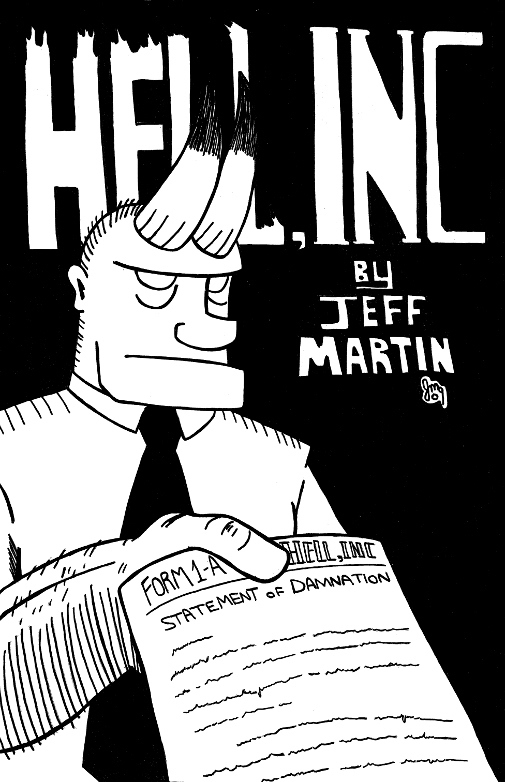 Hell, Inc. started as the project I intended to work on for 24 Hour Comic Day, but my immune system crapped out on me and I ended up with the flu instead. I tinkered with the art style for the project in an attempt to make it something that I could draw really quickly, but over the course of working on it I realized that there were a lot of pages that took WAY longer than I had anticipated. Another thing I didn’t anticipate was that there were A LOT of talking heads, and trying to keep that visually fresh is probably one of the toughest things in comic art. I remember showing my work to an editor at Dark Horse and one of her main comments was that I was using a lot of the same angles over and over again, and since then I’ve made a conscious effort to address that. I now have Wally Wood’s 22 Panels That Always Work sitting next to my drawing table in case I get stuck while looking for some variety. The character designs also lost some of their cartooniness at some point during the art process. I’d been reading collections of old Spy Vs. Spy comics around the time I started designing the cast, and there was a lot of that kind of simplicity in them. B.L. Zebub is the only character who didn’t get much detail added to him, since he’s mostly a giant black blob. Doug got a lot more detail touches to him, like shirt wrinkles and and stuff. Tomorrow I shall endeavour to post some art, which I haven’t gotten started scanning yet. I was going to do it tonight, but I forgot that I had a dodgeball game.